We met up with the Fentons' in Coffs Harbour. 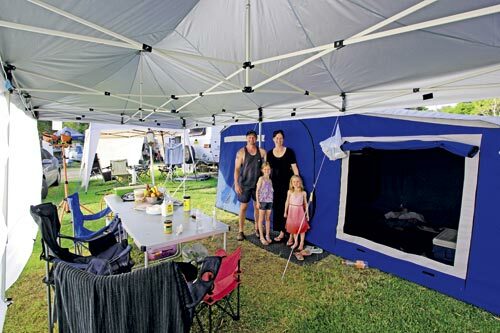 They are new to the camper trailer game, having recently acquired a soft floor camper. It has had a few outings but this was its first serious adventure over the Christmas holidays picking up Copeton Dam,Gladstone (near Kempsey) and lastly Coffs Harbour. The girls, Lauren (6) and Olivia (4), love it and make friends quickly at the campsites. Scott hopes to add a dual battery setup and some LED interior lights in the future so they can expand their horizons away from caravan parks. Names: Scott, Sarah, Lauren and Olivia Fenton. Home on the road: Leisure Matters Off-road. Camper mods: Additional tack welding. Tow vehicle: Holden Crewman dual cab ute. Favourite destination: Our favourite spot is Copeton Dam, NSW. It's a great place when the water supply is high.There are good facilities - hot showers, toilets, kiosk (meals available), cabins, powered sites, boat hire and plenty of shade. Scariest moment: When we ran out of beer at Copeton Dam. It was a classic case of poor planning andover-enthusiastic consumption. We skulked around until around 3pm before deciding to make the run to Inverell, 40 mins away. Lessons learned: Do your research before laying down your hard-earned. The internet has opened up a wealth of opportunities to 'google' various manufacturers and products and seek opinions on the many forums. Don't be afraid to ask questions.